What is happening to me? I just went to the grocery store I’ve gone to for years, and I left bewildered. I wonder if this is how visiting Germans feel. I looked at her in surprise. I didn’t bring them to be nice; I brought them because it’s good to reduce, reuse, recycle—isn’t that what we’re supposed to do? But of course America doesn’t work that way, it wasn’t that way at Seward Co-op either when I shopped there yesterday. Grocery clerks everywhere hand out paper and plastic bags all the time, as many as you want, no questions asked, and no money charged for the favor. I must say I do prefer the German system, once I learned how it worked: bring your own bags, or pay for the convenience of buying bags from the store. Put the incentive where it belongs, like the Germans have. As long as the bags are free, why would anyone bother bringing their own? You almost feel stupid for carrying used bags, like I did when this clerk herself remarked on it, especially when the crisp new paper ones and unsoiled plastic bags are there for the taking, even doublebagged for me in paper at Whole Foods when I stopped in on the way home from the airport for a few small items. As I went inside the store’s sliding doors, I instinctively reached for my purse to fish out a one euro coin to unlock a shopping cart, and then remembered I didn’t need one here; the carts are all there for the taking. 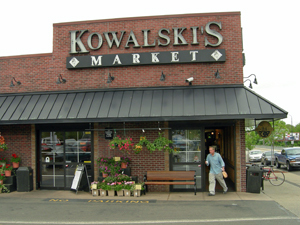 Some stores, like Target, have those anti-theft devices that lock the cart’s wheels should you try to take one off the premises, but Kowalski’s doesn’t appear too worried that its shoppers will make off with their carts. No locks of any kind in sight, which was nice. I lingered at the cut flowers but they struck me as past their prime and overpriced at $8.99 and up, so I passed them by with a sigh, missing the four euro tulips I picked up for weeks on end this spring. I looked at her and shook my head. I looked at her face more closely as if to confirm, but knew without a doubt that I had never see this person before. “You look sort of familiar to me too,” I said feebly. “Do you have kids at JJ Hill?” But of course she didn’t; this was a complete stranger, and I laughed it off, “Maybe we’ve seen each other around the neighborhood,” and pushed my cart toward the dairy aisle to dismiss her, realizing that I’d been called out for staring at a stranger. Which was weird, because I’d thought it was she who had been staring at me. I think all those months in Berlin of looking at strangers without acknowledging them, letting them stare at me because that’s what they do and then feeling entitled to stare right back, has seeped into my ways. I must have been behaving in some un-American way that I wasn’t even aware of. At the deli counter I was grateful for English; I could ask for three slices of thick-cut pancetta and be understood. As the woman behind the counter unwrapped the meat I recalled the times I’d stood at the Kaiser’s deli counter nervously, trying to stammer out the words I’d rehearsed, “Ich hätte gerne drei Stücke hühnchen” or“Funf hundert grams Hackfleisch, bitte,” knowing that the woman behind the counter would grimace as soon as the first words left my lips as if to shield herself from my pronunciation, after which I’d hope that what I’d asked for matched what M was expecting for the meal. More than once I’d come home with the wrong thing, such as three packages of chicken ready for breading instead of three already-breaded pieces of schnitzel from behind the counter, a result of my attempts to avoid all linguistic interactions. I appreciated the “Did you find everything okay?” query from the Kowalski’s clerk at the register, as that was something I was never asked at Kaiser’s, and without fail I always had troubling finding something in that store. Not that I wanted to converse with anyone about it. I biked home with my groceries on the back of my bike just like I did in Berlin, except here I wear my helmet even to go just the few blocks because I don’t want to get glared at by passersby, whereas I used to cross the entire city without one in Berlin, helmets being few and far between there. I find myself hesitant to cross the street on a red light now unless there is truly no one around, behaving like the law-abiding Berliners I used to make fun of. I am surprised at the persistent jaywalkers who run across the street against the light around here. And I don’t want to talk to strangers at a transit stop, by the way, as happened yesterday when I took a trip on the new light rail for the first time with my daughter; why must people strike up conversations with perfect strangers, just because they have the misfortune of being in the same place at the same time? I find myself missing the anonymity of Berlin, the ability to blend in without even trying, rather than constantly smiling and waving and trying to figure out whether a stranger is going to approach me and say something that doesn’t need to be said. This entry was posted in City life and tagged Berlin, bike, grocery stores, Kowalski's, Minnesota, Seward Co-op, shopping, St. Paul, Whole Foods on July 16, 2014 by Jill M..
Okay… is that a “right on” fist bump, or a punch in the face? I know, right? I sometimes wonder about that one! A friend once said that Europeans generally honor a person’s space in public with silence, not wanting to impose or disturb the other’s privacy with empty conversation. What looks like friendliness from Americans can be felt as intrusive or arrogant, as if to say, ‘my smalltalk must be more interesting to you than your own thoughts.’ That said, smiles are pleasant and curiously refreshing after being overseas for a length of time. I have to say I do like the respectful quiet among people in public places in Berlin (and perhaps across Europe), and how people tend to only ask you a question if they truly need the answer (what time is it, what direction does this bus go, that sort of thing). But I do enjoy the smiles here, it’s true. In moderation. Try Aldi; they make you pay for bags and carts. I remember the first time in the grocery store in Michigan when the checkout person asked how I was. I was amazed and welcomed. This was not what was done in New Haven, the anonymous East coast! Maybe Aldi will seem about right after a year in Berlin. The cart payment is only a deposit, at least in Berlin. That’s your incentive to give the cart back! Retrieve your 1 euro. And I’m sure you’re right that the Midwest has a particular brand of friendliness beyond the rest of the country, certainly more so than the east coast — thus the stark difference I had to note, coming recently from Berlin! This is truly funny! Well observed. But what does it mean that we have such different ways of behaving in public? I keep wondering…. There must be some undercurrent that I still find difficult to understand. It’s hard for me to put my finger on it, but I guess I’d say that Berliners (by and large; not the drunk ones) keep to themselves and respect one another’s privacy; they are quiet and calm and civil to each other and don’t intrude on each other’s personal space, and they find it acceptable to observe one another without it being construed as staring or intrusive. And it seems to me, in this sort-of heightened state of difference I’m temporarily in, that Twin Citians are quick to smile and acknowledge one another, quick to speak and jump in and offer an unsolicited opinion, to begin talking as if you already know one another, and there is something sort of comforting about this, though it can be annoying at times. And here people do look at one another, just as much or maybe even more than in Berlin, yet they are sneaky about it, and you catch people looking away, and it doesn’t feel flattering, it feels like you’ve just been scrutinized and then have been dismissed. I felt “stared at” in Berlin because people aren’t as quick to look away and disguise what they were doing; here it actually sometimes feels more disingenuous. I guess I got bumped a few notches on the continuum toward a more German sensibility — it kind of appeals to me! What do you think, Hanna? I had a good laugh with this one, but you are right on with this post on the cultural differences between North Americans and Euros. She was completely horrified at the presumption. After all she did not have our photos on public display why on earth would she want the neighbors? Europeans tend to be more private, opening up only to those they actually know. It is hard to explain, but what is often perceived as rude or cold to North Americans is simply being respectfully mindfull of personal boundaries. When they do engage in conversation it is more honest and genuine……small talk is a waste of time. Having said that! experiencing friendly service s nice I won’t lie. Very funny, Kiki, about the gift of framed pics of the neighbors’ kids! And I agree, somewhere there’s a good balance between small talk and being friendly.